A miniature statue of the Illinois Centennial Monument Statue, which will be available for purchase starting next week. LOGAN SQUARE — What better way to celebrate neighborhood pride than bringing a piece of the Logan Square into your living room? 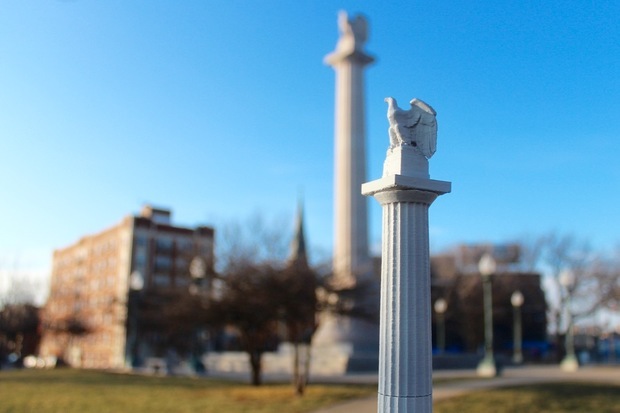 Miniature versions of the Illinois Centennial Monument, known to many as The Eagle, are just about ready to go on sale. The project, a partnership between Logan Square Preservation and the Chicago Public Library, has been in the works since February. Thirty of the miniature statues were sold during this past weekend's Logan Square House and Garden Walk, and by the end of next week 70 of the statues will be on sale at Liberty Bank, 2392 N. Milwaukee Ave.
Each statue, standing just taller than one foot, costs $50. The neighborhood group will ship a statue to anyone interested for an additional $7. The statues will be available on a first-come, first-serve basis. "All of the money we raise goes right back into the neighborhood," said Andrew Schneider, president of Logan Square Preservation." Assuming the statues sell out, the neighborhood group is planning to take preorders for a second batch of 100 statues that will be ready by the end of October. The monument statues were crafted out of a resin and were made possible by a 3-D laser scan of the monument that was conducted in the fall. The original model for the statue was made on a 3-D printer in the Chicago Public Library's maker lab last year. Logan Square Preservation will use the proceeds on projects such as replanting trees lost to emerald ash borer on the boulevards, clearing snow on the square and advocating for preservation of the neighborhood's unique architecture.